Did you know June is National Dairy Month? 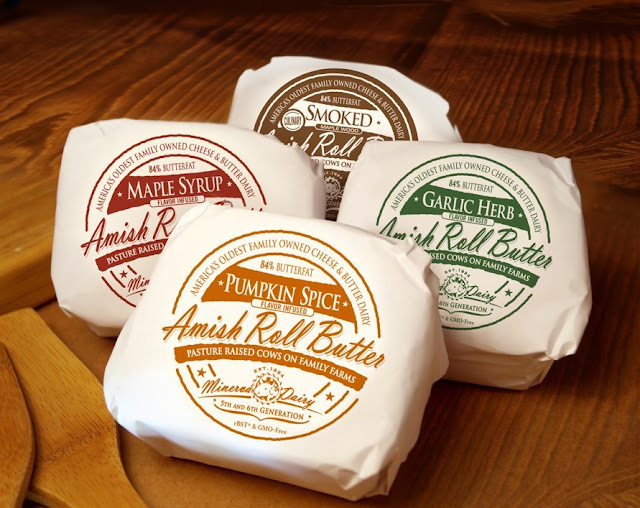 In celebration of the natural goodness produced by our nation's dairy farmers, Minerva Dairy, the country's oldest family-owned cheese and butter dairy farm is offering a giveaway of some of their flavored butter. Now operated by a 5th and 6th generation, Minerva Dairy dates back to 1894. They still produce an 84% Batch Churned Amish Butter as well as a variety of cheeses - among them Swiss, Gouda, Colby and Cheddar. Gift baskets are available online for those cheese lovers in your life who enjoy fine varieties of cheese. Besides natural flavored butter produced by pasture-raised cows, you'll find flavors such as garlic herb, maple syrup and cinnamon. Find out more about the company and their products and order online at www.minervadairy.com. Contest runs through June 28. Good luck! Garlic Herb is my pick! I would also like to try the Garlic and Herb, although the Smoked butter sounds interesting also. I would love to try the Garlic Herb! Wow that looks good! I'd like to try maple syrup. I want to try the Smoked Maplewood flavor!